When Antonio Vivaldi was born in 1678, his father Giovanni was a professional violinist employed by the Basilica of San Marco in Venice. Antonio no doubt studied violin with his father and, by time he was a teenager, he was occasionally subbing for his father at San Marco and being hired at the basilica as an extra player for special occasions. Despite this background in music, Vivaldi’s life seemed to be aimed at the priesthood. He was known during his life as “The Red Priest,” a reference to his red hair. He studied for the priesthood at several churches in Venice beginning when he was 15 years old and was ordained at the age of 25. However, within a few years of his ordination, he permanently stopped celebrating Mass, but still retained his status as a priest (and presumably retained other priestly functions, such as hearing confessions). Famous 1723 caricature of "Il prete rosso" by Pier Leone Ghezzi. The reasons for this change are unclear. 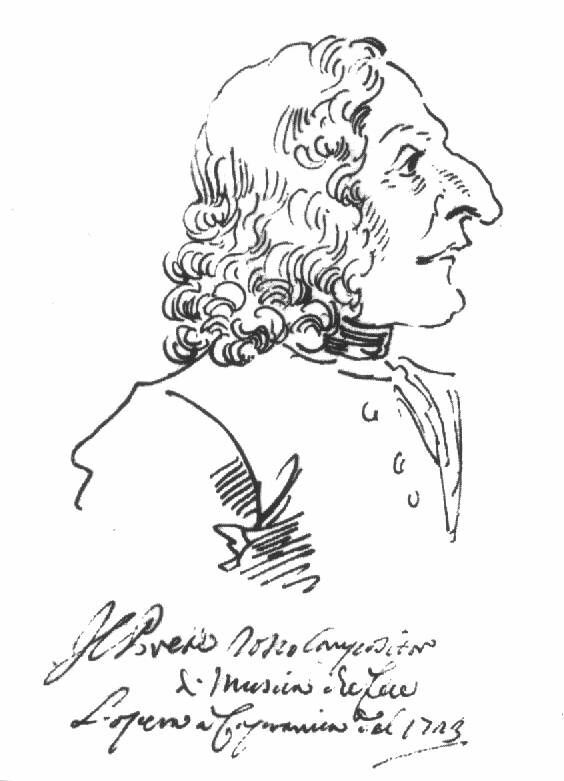 Vivaldi is known to have suffered all his life from bronchial asthma, which could possibly have interfered with his ability to speak and chant for the duration of a Mass. There is a story, almost certainly spurious, that Vivaldi once left the altar in the middle of Mass to return to the sacristy. In the story, the reason was that a clever fugue subject had just occurred to him and he wanted to write it down before he forgot it. If the story is true, it could also be that he had an asthma attack during Mass and needed to sit down. It is also known that some years later, Vivaldi was censured for conduct unbecoming a priest. Although the reason for Vivaldi’s censure is unclear, it is also possible that the reason was also related to his decision to stop celebrating Mass. Despite the fact that Vivaldi did not celebrate Mass and despite any difficulties with the church hierarchy, he was known during his life as a pious man and frequently wrote an abbreviation of the religious motto “Laus Deo Beataeque Mariae Deiparae Amen” on his manuscripts. Editor's Note: We think that might mean "Praise God, the blessed Mary, and the Son of God. Amen." However, we're not sure. Do you know? Most of us are a bit rusty with our Latin (if we ever took it in the first place). Praise God and blessed Mary the Mother of God. You were close.